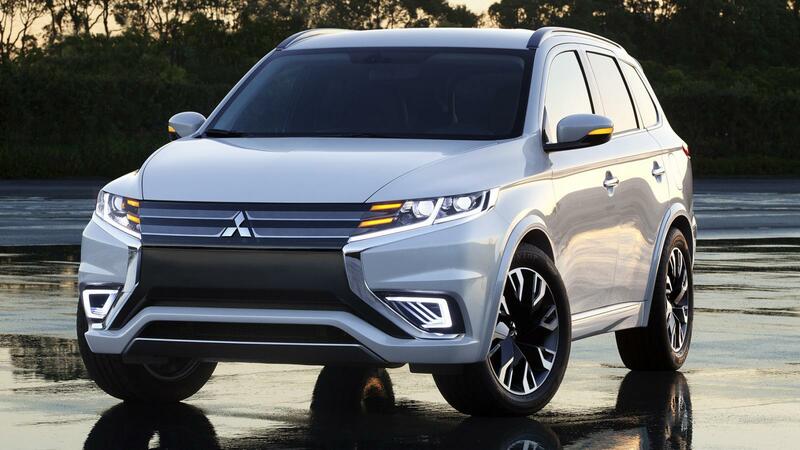 Mitsubishi has revealed the facelifted Outlander PHEV at an event in Tokyo. From a glance, it might seem the company’s just stuck a new set of bumpers on but, look under the skin, and Mitsubishi’s modifications become more obvious. The Outlander PHEV makes up an amazing 50 per cent of electric and plug-in vehicles sold every year in the UK, so what changes has Mitsubishi made to continue the success of this highly popular SUV? We compare the outgoing and brand-new models to find out. Put the Mitsubishi Outlander PHEV into our car configurator to see how much carwow could help you save. To see a range of excellent hybrid cars, read our list of the best hybrid cars you can buy. The new car’s styling shouldn’t come as a surprise. The Outlander PHEV Concept S shown at the 2014 Paris Motor Show previewed many of same design features including the much larger and more angular grille, LED headlights and a new foglight arrangement. More heavily detailed side skirts sport contrasting inserts and, although the rear light profiles remain more or less unmodified, the boot lid now comes with a horizontal chrome strake. A deeper rear bumper with slimmer vertical reflectors and redesigned alloy wheels complete the exterior changes. The whole range is now fitted with leather seats and features climate control and cruise control as standard. The top of the range model, the GX5h, includes a host of new functions for the large touchscreen infotainment system including DAB radio and offers a comprehensive exterior parking camera system. While details have been refreshed, the spacious if not world-beating interior layout has been left mostly unchanged. The Outlander PHEV remains a very practical and versatile family offering. The new Outlander PHEV uses the same tried and tested powertrain arrangement as the outgoing model. The 2.0-litre four-cylinder petrol engine and two axle-mounted electric motors have been refined to dramatically improve acceleration. Previously a slightly sluggish vehicle, especially from rest, the revised Outlander can accelerate from 0-25mph an impressive two seconds faster than the outgoing car. On-board controls allow the driver to switch between fully electric or hybrid drive modes and between two- and four-wheel drive. At slower speeds, the Outlander PHEV can be driven in fully electric mode for up to 32 miles with the petrol engine firing up as a generator when needed. On the motorway, the four-cylinder unit is mechanically connected to drive the front wheels rather than re-charge the batteries which helps the Outlander PHEV to be more efficient across a variety of speeds. The Outlander emits a very minimal 42g/km of CO2 meaning it’s currently free to tax and will incur no congestion charge. The PHEV’s suspension mounts have been redesigned and strengthened, while the springs and dampers have been adjusted to produce a flatter and less bouncy ride. More predictable handling and less body roll helps ensure a feeling of safety and security behind the wheel but might come at the expense of refinement on bumpier roads. All Outlander PHEVs come with collision mitigation and brake assist systems as standard and will protect the occupants in the event of a collision with an array of seven airbags. The PHEV is available to order now. Thanks to its impressive efficiency and low emissions, it’s eligible for the £5,000 government grant for electric and plug-in hybrid vehicles. This bonus reduces the basic price to £29,249 for the GX2h model, while a highly specified GX4h version will set you back £35,999. Put the Mitsubishi Outlander PHEV into our car configurator to see how much carwow could help you save. If you haven’t made your up mind just yet, our car chooser and deals pages can give you a helping hand.